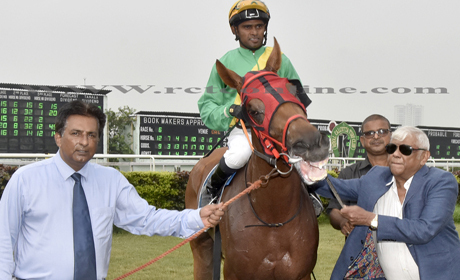 Trainer Javed Khan`s 6/1 shot Carpe Noctem (app. 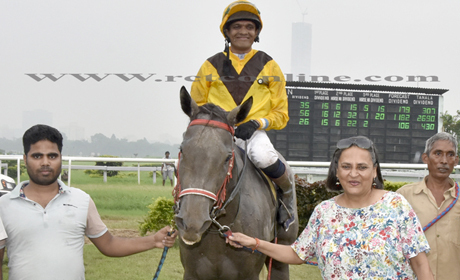 Pandula Vikram-up) scored a narrow victory over Vijay Singh`s equally fancied runner, Levante (app. Nikhil Naidu), in the 1,100m Slade Valley Cup, Tuesday`s feature event. 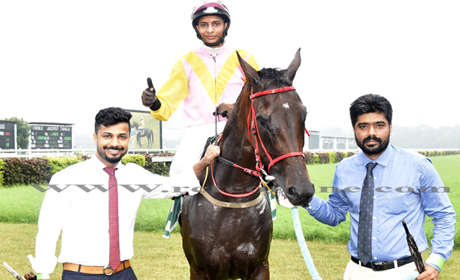 The afternoon also witnessed favourites playing hide and seek game in the seven-event card but trainers Vijay, Arti Doctor and Jasbir Singh profited most to end the afternoon with priced doubles apiece. Carpe Noctem tried to make a short-work of the opposition in the 12-horse field but just about lasted out to score over Levante who was always close behind the leader almost from the start. The 5/4 favourite, Coup De Grace brought about the biggest disappointment in the race after a fly jump out. He, being the only three-year-old in the field, hopes hanged around his performance but the frontline youngster may have to wait for another day. Coup De Grace did recover from the four-length deficit at the start but failed to do a miracle over the scurry, though he placed an impressive third behind the fighting pair, to warrant support again. The Burden of Proof filly, Christiana (app. Naidu) displayed vast improvement, during the two seasons, as she took the measure of her five rivals in the 1,200m Alcalde Plate, the baby race. The Vijay`s ward performed like a matured youngster, too. Christiana allowed the stable-mate, Duchamp (C.S. Jodha) to lead from Bharath Singh`s Ghost Creek (C. Alford) in the early half of the race. Naidu also waited patiently when Ghost Creek broke away from the field in the home stretch. It was in the final furlong that the apprentice worked his way up to stump Tazaum daughter at the winning post. Vijay`s Akshaya looked a winner during the paddock-parade for the 1,400m Silver Fox Handicap. 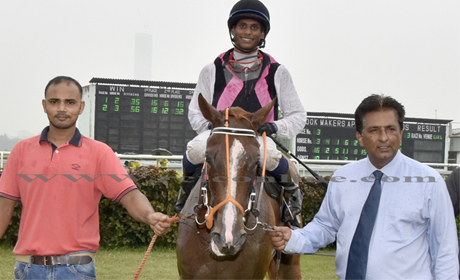 However, the Varena daughter was freely available as 3/1 chance as Bharath`s pair of Alldero (Dashrath) and Rufus (Trevor Patel) attracted quite a support. However, Akshaya and Naidu hardly needed to do anything special to win the race. 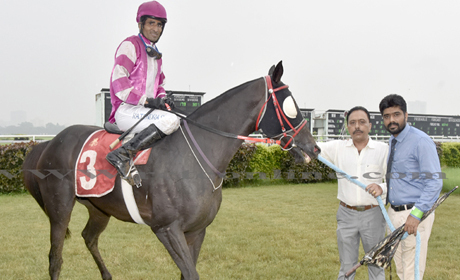 In the hot chase of Bharath`s third horse in the fray, Gryffindor (Sk Israil), Akshaya came abreast the leader soon after turning for home and drew away from the late finishing Alldero who badly needed the run. Arti hasn`t been having much of luck in recent months but she woke up to strike hard on Tuesday. 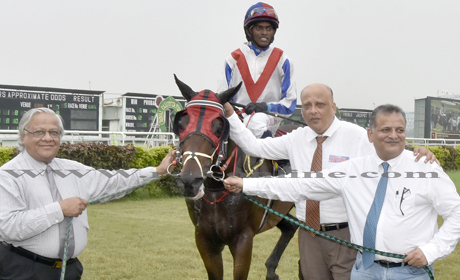 Her two winners – Prancing Queen (Shrikant Kamble) and Friendship (C. Alford) – in the respective events, the 1,200m Echoes of Light Handicap and the Flamenco Star Handicap, brought about a disaster for the pool hunters. Incidentally, each of Arti`s two long shots won at the expense of Vijay`s hot favourites – Advika (Naidu) and Mahali (Neeraj). Advika performed poorly after a slow jump out while Mahali was brought into the fray after Friendship had established a winning lead, a long one. Jassbir was man in a hurry. The crafty trainer notched up his brace of wins in the opening two events. In the 2,000m Mandolin Handicap, Jasbir`s Zandra (app. 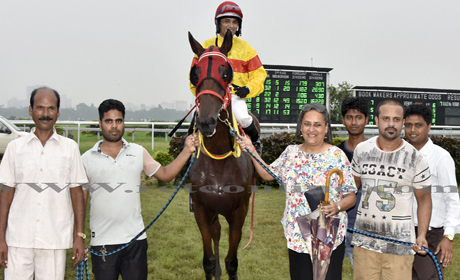 Rupal Singh) led from the start to leave Vikash Jaiswal`s Hail The Queen (Jodha) in the wild goose chase while the trainer`s Blaze To Glory (Rajinder Singh) was brought with a late run to beat the long time leader Dark Angel (Hindu Singh) and the 3/1 favourite, Amaranthus at the post.